Little Dude is a huge fan of macaroni and cheese. Like me, he enjoys is as creamy and cheesy as possible. I had one of those big blocks of American cheese in the pantry with the intention of making Kelly's cheese soup. But the weather started warming up before I had a chance. Now I can eat cheese soup all year long, but my husband is a hard sell on soup any time of year. So I figured rather than push it, I'd use the cheese to make ultra smooth macaroni and cheese. Half of the block went into a stove top version. I served it with some root beer braised pulled pork that I am sharing with you soon. Little Dude was in heaven! He gave it twelve thumbs up and would have written his name on the leftovers with permanent marker if I had let him. So when we took advantage of a nice day by grilling some burgers, I figured I'd use the rest of that cheese for more macaroni. 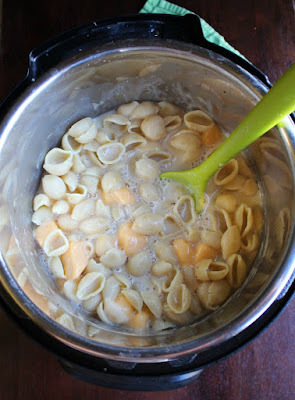 This time I pulled out some large shell pasta to more closely emulate that favorite boxed side dish. Plus I pulled out the instant pot to make it so I could set it and forget it a bit more. After making creamy spaghetti and meatballs in the instant pot, I was hooked on how easy it is. You don't have to patiently wait for the water to boil and then watch the pot for boil overs. Instead you just set the time and pressure and enjoy your family! The only word of warning is that the starchy water can make a bit of a mess when you vent the steam. No worries though, I have a trick for that! Just place a damp dishcloth over the vent when you release the pressure. It will catch the mess and prevent starchy splatter. I learned that from MiMi after watching her make mashed potatoes in her pressure cooker. One the pasta is cooked, the starch liquid left behind is the perfect base for the cheese sauce. Add a little milk and a whole heap of cheese to make it extra good. A couple of minutes on saute is all it takes to melt it together. It will likely be a little loose still, but will thicken a bit as it sits. Just don't plan on it sitting too long, it will disappear into bellies as soon as you give the go ahead! This version got 36 thumbs up from Little Dude and some happy noises from my husband too. Place a damp dishrag over the vent on the pressure cooker to catch any starchy splatter. Start with just a splash of milk and add more if you need it. Cutting the cheese into small cubes will help it melt faster and get dinner on the table quickly. 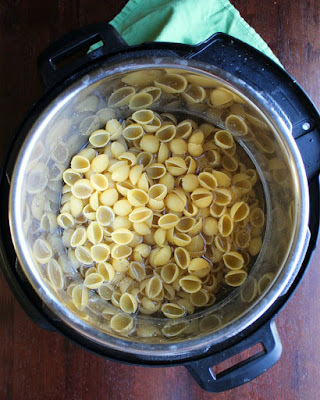 Place pasta, water, salt and pepper in instant pot. Cook on high pressure for 4 minutes, then quick release the pressure. Place a damp rag over the pressure release to catch any splatter. 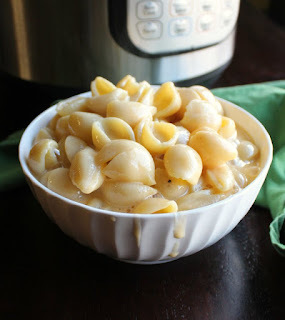 Stir in milk and cubes of cheese, turn instant pot to sautee if needed to make sure all of the cheese is melted. Allow to sit for about 5-10 minutes with the instant pot off to thicken a bit, then serve. 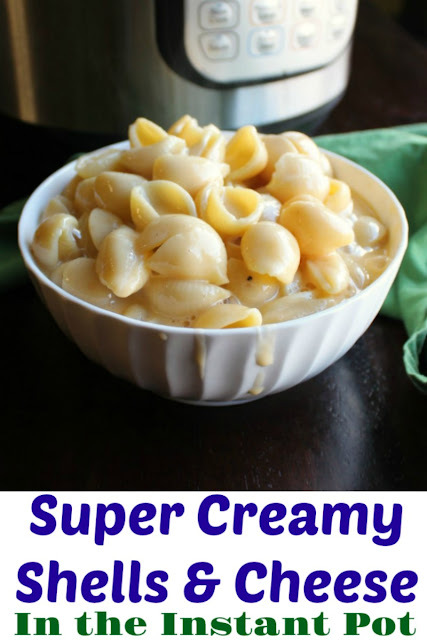 Oh we sure do love it creamy so this is a huge winner! We do too, the cheesier and creamier then better! Hi Carlee, it's been a while since I've made macaroni cheese. I tend to make it as a stand alone dish with salad in the warmer months... 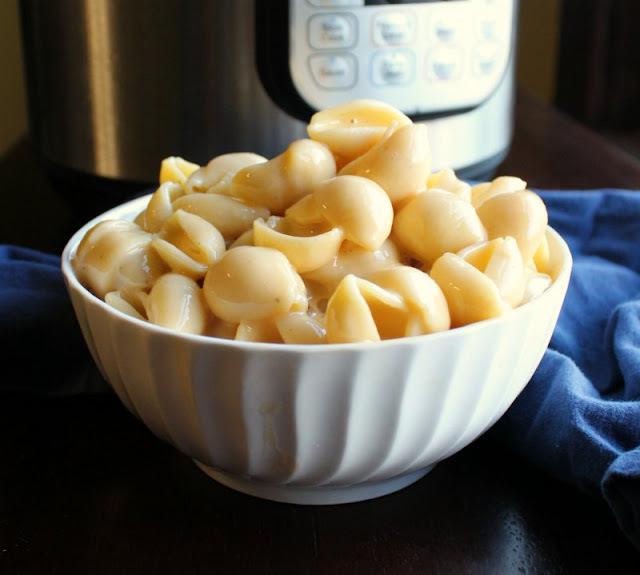 It has to be creamy and your instant pot seems to do the job perectly. I could totally make a meal of macaroni and cheese with a salad! Thanks, Deb! I think that my son will like this better than the box! I am going to let him try making this today!!! Thanks! I am sure he will! I hope you enjoy it! I'm so excited to make this. Putting cheese on the shopping list! What a great idea! 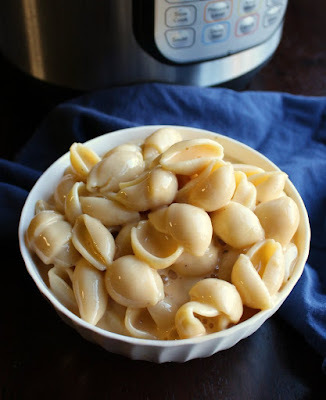 I love making pasta in the Instant Pot, and this looks like the ultimate comfort food dish! Isn't it such a great way to do pasta? Thank you!